This package makes the whole process extremely easy, because you can use the EpsGraphics2D object as if it's a Graphics2D object. The only difference is that all of the implemented methods create EPS output, which means the diagrams you draw can be resized without leading to any of the jagged edges you may see when resizing pixel-based images, such as JEPG and PNG files. This makes them ideal for including in publications and papers with LaTex or suchlike. You do not need to worry about the size of the canvas when drawing on an EpsGraphics2D object. 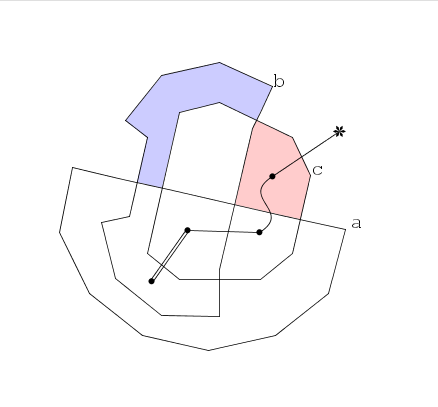 The bounding box of the EPS document will automatically resize to accomodate new items that you draw. If you are using GSView to view the output, you should select the "EPS Clip" option if the drawing does not fit on the first page. The jar file includes some example output and the program that was used to create the output. The example drawing was made by TestMain.java and resulted in the creation of output.png and output.eps. 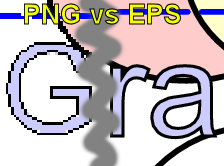 The PNG file was created with a standard Graphics2D object, while the EPS file was created with an EpsGraphics2D object. Notice that the EPS file can be resized better than the PNG version. Also notice that the EPS file has automatically set its bounding box so that the large pale blue circle fits completely, unlike the png file where it has the edges clipped. This sections contains some useful tips for those who wish to go beyond the basic features of EpsGraphics2D. EpsGraphics2D stores documents in memory by default. If you are working with huge EPS documents, it may be beneficial to write them directly to disk (or even a zip file). In order to do this, you will need to manually specify the bounding box of your document before it is drawn. One of the constructors lets you specify the OutputStream and bounding box. Anything drawn on this EpsGraphics2D object will be written straight to the OutputStream, which saves memory. // Create a new document with bounding box 0 <= x <= 100 and 0 <= y <= 100. EpsGraphic2D defaults to using "accurate text mode". When this mode is used, all text will be rendered in EPS to appear exactly the same as it would do when drawn with a Graphics2D context (e.g. 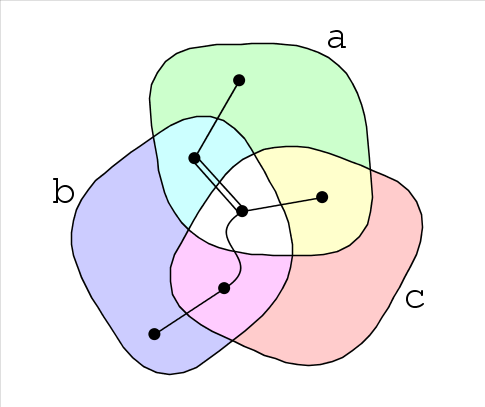 on a Swing component). With accurate text mode enabled, it is not necessary for the EPS viewer to have the required font installed. Turning off accurate text mode will require the EPS viewer to have the necessary fonts installed, otherwise it will pick its own default font. If you are using a lot of text, you will find that this significantly reduces the file size of your EPS documents. One drawback to turning off accurate text mode is that AffineTransforms will only affect the starting point of text using this simpler text mode - all text will be horizontal. The default resolution used by postscript is 72 dpi (dots per inch). It is possible to increase this to 300 dpi (or indeed any other resolution) by scaling the instance of EpsGraphics2D before it is drawn on. Likewise, to obtain 600 dpi you should scale the image by a factor of 0.12 and for 1200 dpi you should scale by 0.06. These higher dpi settings are useful for print and typesetters or graphics rips that are incapable of performing their own scaling. EpsGraphics2D generates full color RGB output by default. This can be changed via the setColorDepth method. When the color depth is set to grayscale or black & white, EpsGraphics2D will automatically convert color images to 256-color grayscale or 1-bit black & white as appropriate. 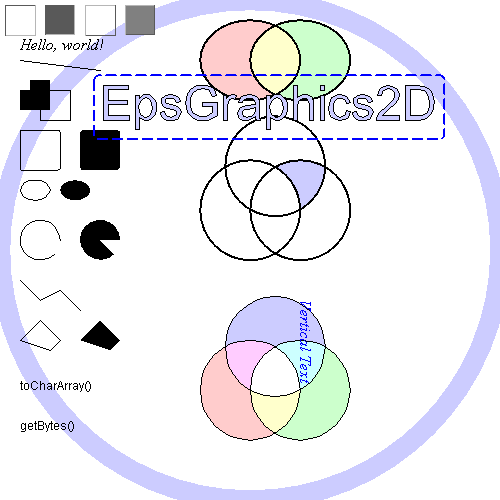 EpsGraphics2D single-user non-commercial license with source. For non-commercial use by a single end user on a single computer. EpsGraphics2D unlimited-user commercial license with source. For unlimited commercial use within companies, distribution within proprietary applications, world wide web and internet usage. * Download instructions will be delivered via email once your purchase has been approved. Contact me if there are any problems downloading your purchase.